During my many years working in travel, I’ve taken great pleasure in sharing my experience and introducing my clients to the stunning beauty, the natural and historical wonders – as well as the small local delights – to be found throughout Latin America. But I have to admit, for the most part, my focus has probably been on South America, occasionally straying into Panama and Costa Rica, or up to Cuba (with the current political spotlight on that country, there’s certainly been an upsurge in interest and requests to go there). However, not so long ago I had an unexpected opportunity to go to Mexico – or I should say, go back to Mexico after quite some years – and I’ve fallen in love with it all over again! You can now call me a born-again aficionado, even borderline fanatic, of all things Mexican, as I’d kind of forgotten how exciting and lovely this country is. As I can’t cover everywhere I went in this short space, let me tell you about Oaxaca (if you’re struggling, it’s pronounced ‘wa-hah-kah’) – because the state of Oaxaca represents a ‘Best-of-Mexico’ tasting plate of all the things that come to mind when the country is mentioned. Riotous colour and music, great food, gorgeous handicrafts, ancient ruins and colonial art and architecture, beaches and all-round superb scenery! With other places to go to on this Mexico trip, I had time only to visit the capital, Oaxaca City, but it was wonderful and fascinating (and, just so you know, it has a reputation as one of the safest Mexican tourist destinations you could choose). The city is about 500km south of Mexico City and, while officially founded in 1529 (early Spanish colonisation), the area it covers has been inhabited since prehistoric times. Monte Albán, the nearest and most important archaeological site, set spectacularly on a mountaintop about 16km to the west, was the first capital of the Zapotec (the ‘Cloud People’) civilisation that lived here from 500 BC to 900 AD. 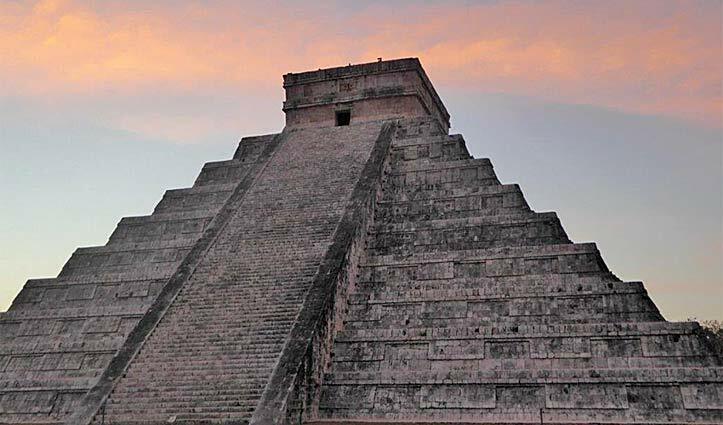 From here, and later from nearby Mitla, they dominated the southern highlands and traded with the Olmec, Teotihuacan and Maya civilisations. 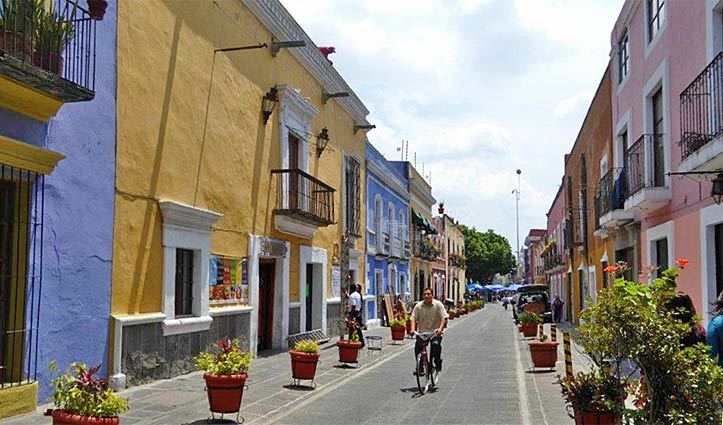 The other attraction everyone comes to see are the city’s 16th-century colonial buildings that have been meticulously restored and now house all kinds of galleries, museums, hotels, and restaurants. Of course, present day life and culture is very vibrant and you can experience it through the food and the markets, the handicrafts and the marvellous festivals – I imagine that being here for their ‘Day of the Dead’ celebrations in November would be amazing! 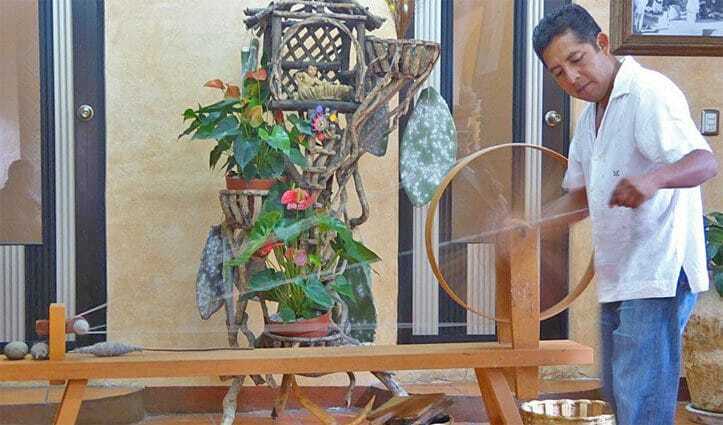 During my stay, I had a chance to visit the weaving village of Teotitlán del Valle, 30km out of the city. 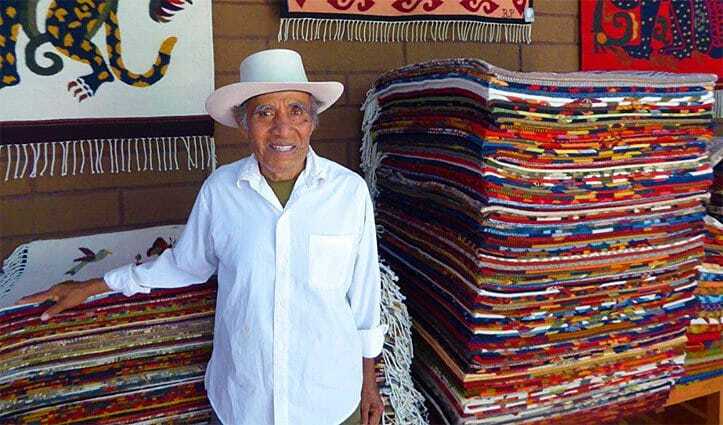 I just love Latin American textiles and was excited when our small group was invited to have lunch with Bulmaro Pérez Mendoza, a highly-esteemed weaver, and his beautiful family. We learned that the weaving tradition goes back to pre-Hispanic times when the village was obliged to pay tributes of cloth to the Aztec rulers. Bulmaro showed us how they prepare the raw wool bought in the markets from farmers of the Mixtec region (he actually incorporates mohair into his textiles these days as he believes it’s more enduring) and demonstrated the spinning and weaving techniques. And he showed us how he was taught by his father to create the traditional dyes from natural sources like indigo, cochineal – made from small insects native to Mexico and South America to produce the vibrant red textiles for which those cultures are known – and various mosses and flowers (be aware that many weavers continue to use much cheaper synthetic dyes). Along with traditional patterns, Bulmaro has created a number of semi-abstract designs that have become his signature pieces. The whole experience didn’t feel in any way ‘touristy’ and there was no pressure to purchase any of the textiles. The Pérez Mendoza family do such beautiful and elegant work – his wife, mother, grandmother and great-grandmother are all involved and his father proudly watches on – and you really appreciate the hard work that actually goes into the designs and production. So, yes, I bought several weavings from this very humble and gentle man with the beautiful smile, and it was an instance when I certainly didn’t feel any desire to bargain at all! Casa Oaxaca – An 18th-century colonial manor house converted into a chic boutique hotel, 5 minutes’ walk from the historical centre. White colonnades lead to seven spacious rooms, each differently decorated with original art and local handicrafts in a striking and contemporary Oaxacan style. There is a lovely pool in the rear patio, and art exhibits in the beautiful inner courtyard. The meals in the great little restaurant are a modern and refined interpretation of traditional Oaxacan cuisine – cooking classes with the top chef are available. Quinta Real Oaxaca – This 16th-century former convent is one of the city’s landmarks and was converted into a luxury full-service hotel in the 1970s. Much of the original structure was carefully restored and frescoes and original tile floors remain on display. The old chapel is now a banquet hall, and one of the five attractive courtyards contains a swimming pool. Each of the 91 suites is unique, surrounded by gardens and with a view of the picturesque old streets of the Centro Historico. 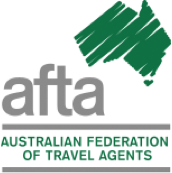 To book this experience contact us on 1300 784 794 or email us at: contact@satc.com.au.